Here’s a cool idea: Rene Engström and Rasmus Gran have a long distance relationship and have decided to chronicle it in parallel diary comics (I would say it’s a unique idea, but I’ve actually seen at least one other!). In other news, my host in Barcelona, David Macho Gomez, is launching Spanish comics site spanishinq.com. 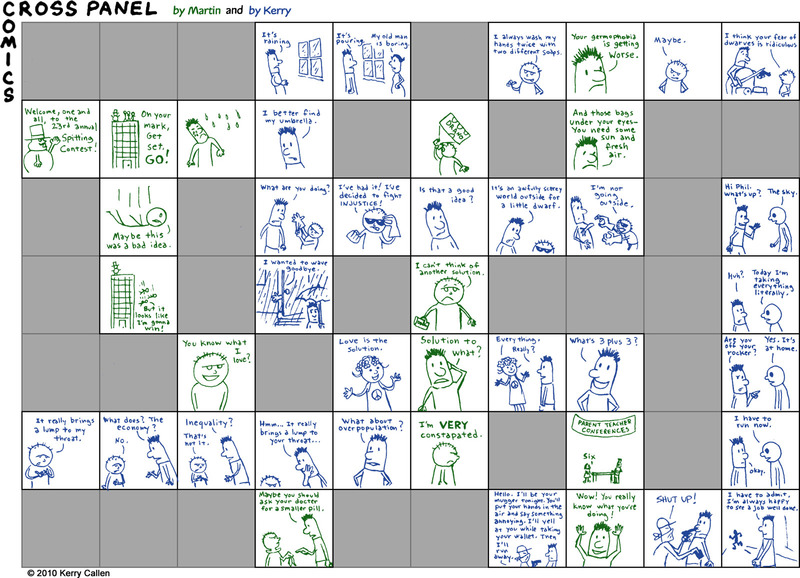 For those of you who enjoyed Choose Your Own Carl (back in the Jurassic era), here’s another crossword-style comic. And finally, on the work front, I’ve now finished the second rough draft of my graphic novel (working title The Sculptor). Next step: Beginning many months of finished art (and probably going back to make some more changes to the roughs, but that’s to be expected.) Wish me luck! I’m even okay with the ’60s Batman-style sound effects! Thanks, everyone I’ve ever known for telling me about this as soon as I got home. Oh, and hey, as long as it’s Random Friday, I’ve got a question: I’m dying to find a reeeeeally old music video from the ’80s—maybe even pre-MTV. It had a funky, electronic song (possibly no words) with black and white, photocopy-style animation. There was a recurring assembly line motif with hamburgers and hands and that creepy masonic eye/pyramid thing. Really cool and jerky, almost like it was made by a robot Terry Gilliam. Does anyone remember this video? I’d love to find it out there somewhere but I don’t know anything about the director or even the musician(s) involved. UPDATE: It was the experimental film “Machine Song” by Chel White. Thanks to music video master Alex de Campi for the answer! As some of you might have guessed, based on past blog entries, music is very important to our whole family. Sky is going to Coachella this year with a friend of ours and I’m envious, but after Italy, I’m going to be too eager to get back to work on the book, so I’ve got to miss it yet again. I love that my daughter has been listening to bands like Passion Pit, Hot Chip, and Vampire Weekend* (all at Coachella) while simultaneously getting into Bob Dylan and Bob Marley, on LP no less—and that I had nothing to do with those last two. Well, any of them technically, (though I did discover Edward Sharpe and the Magnetic Zeros before her). I used music constantly while working on the first draft of the layouts for the new book. I had several different playlists for different kinds of scenes and I’d go for long walks trying to imagine sequences, while letting the music sustain the mood I was going for. That trance I needed to put myself in while conceiving sequences would now prevent me from evaluating those scenes objectively. More proof, if any was needed, that we need to appeal to different aspects of our creative personality at different stages of the creative process. *Pop Quiz: If I added Peter Gabriel’s name to those three band names and asked you which of the four was not like the others, which would you pick and why? New Yorkers: Where do You Live? And Why? As I’ve been working on my Manhattan and Brooklyn-based story from far away, I’ve been building a mental map of life in the city today, but it still has plenty of holes in it and it’s been a long, long time since I’ve lived there myself. For anyone out there living in working in Manhattan and Brooklyn especially, I’d be curious to hear about the neighborhoods you live in and why you chose to live there. Just for fun, here’s a distant screenshot of all 466 pages of my rough draft layouts for my upcoming graphic novel (working title The Sculptor). This is as close as I can bring you right now, but as work goes on in the coming months, I promise to show some actual art. It’s a testament to the speed of today’s processors—well, 2007′s processors—that what you’re looking at actually exists in a single file and if zoomed in, the lettering is readable. To get a sense of the scale, each of those dark gray rectangles is a two-page spread chapter divider. When heading into rewrites and restructuring, it’s always helped me to step back and look at “the big picture.” For all my previous projects, including the all-digital Making Comics, I had to depend on paper layouts to get that kind of topsight, but for this project it’s all pixels from start to finish. Oh, and yes, I still plan to make it shorter during the next two months, even though I had to adjust the count upwards from the last blog post. Belated Happy Birthday to Ivy! We went to Disneyland for her birthday on Tuesday after a very full day of work Monday, and yesterday was a lot printing and mailing, so I didn’t get much blogging, tweeting, or, um… facing… in this week. Round One of the “rough draft” for the graphic novel is done! I’ll be working on revisions/rewrites for the next couple of months and then, starting in March, I’ll be doing finished art for two years. The book is currently at a whopping 461 pages, but I’m hoping it’ll get shorter in revisions. (Note that my “rough draft” is basically just a rough sketched-out version of what the finished book will look like, all captions and balloons in). Fun fact: My roughs are done forty pages at a time in a single photoshop document so I can slide panels back and forth and think of the flow more organically and not let the page dictate pacing too much. They’re really big files! The whole family is getting into the Avett Brothers this year. The preview for Iron Man 2 makes me feel 14 years old again. In a good way. Best comic of the year? For me, probably Asterios Polyp, but now that I have a bit of free time, I need to read a few more contenders. Creatively, I thought 2009 was a great year for comics, music, and movies. Financially, though, it sucked donkey balls for a lot of people in our community. Let’s hope ’10 is better. In the next few weeks, I’ll be finishing the first draft of the layouts for my graphic novel (working title, The Sculptor). Then on to revisions through February and production of the actual artwork over the course of two more years (it’s about 400 pages). It’ll be done in early 2012 (and yeah, 3 years for a GN may be a long time but hey, at least it’s still quicker than Habibi). I’m not talking about The Sculptor much on this forum yet because it’s too early, but I’ve been more consumed by this project than anything I’ve ever done, so it’s definitely on my mind night and day. If First Second and I decide to share any of its progress visually next year, you’ll read about it here first. For now though, enjoy all the other great GNs on the market and know that I’m working seven days a week, eleven hours a day on this book when not answering email or traveling. Speaking of which: My email inbox remains an ongoing avalanche, so please forgive me if my responses have been sluggish. I really am trying to answer all those various requests and urgent messages as fast as I can, there are just so many of them. Seriously, picture Ringo Starr in that Simpson’s episode where he gets around to Marge’s fan mail. That’s me. I’ll be updating the travel sidebar soon, with upcoming engagements in Portland, Pennsylvania, Indiana (again) and London (twice). Not all are public, but I’ll try to give you fair warning if I’m coming to your city or school. Originally planned as a solitary expedition, this part of my trip still had me crossing paths with some old friends including Tracy White and baby Suniva, Heidi MacDonald and beau Ben, and the Legendary Brian Dewan who was showing his work with a bunch of terrific cartoonists Thursday night as part of the Cartoon Carousel series (which is very cool, though I’m not sure how to explain it, and I’m not sure if they have a website). Also saw a slew of great artists, old and new, at S.V.A.’s great Fresh Meat show Saturday and met briefly with the astounding Shaun Tan at the tail end of his signing at Books of Wonder. Dropped out of sight a bit, web-wise these last few days, but it was for a good reason. I’ve been thinking non-stop about the graphic novel and the role of this city in the story. It’ll be a long time before I can show you guys anything from the book, but I hope it’ll be worth the wait. I still have a few trips to go (including fun ones like next week’s TCAF), but there’s big part of me now that just wants to draw and draw and draw and draw and draw and draw.